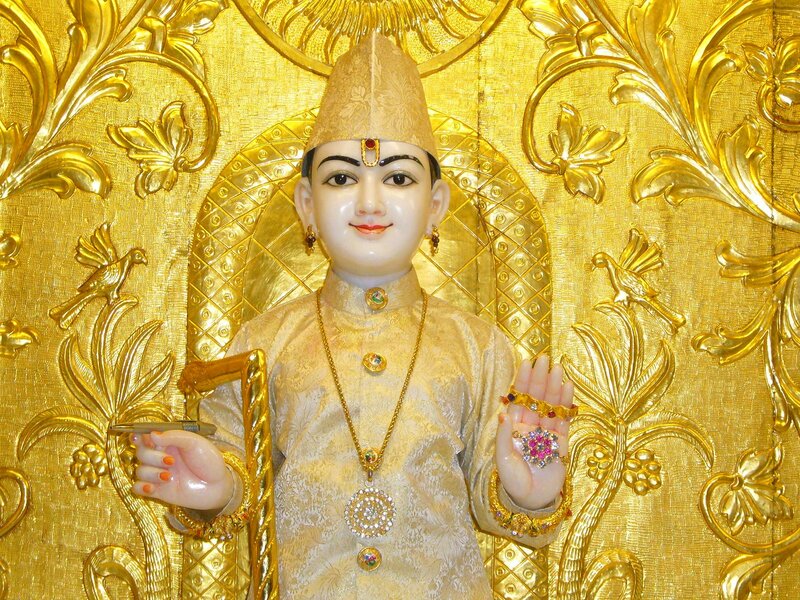 Today is the birthday (1781) of Swaminarayan , also known as Sahajanand Swami, the central figure in a modern sect of Hinduism known as Swaminarayan Hinduism, a form of Vaishnavism. Swaminarayan was born in Chhapaiya, in Uttar Pradesh province, a village near Ayodhya, in a Hindi speaking region in India. He was born in the Brahmin caste of Sarvariya and was named Ghanshyam Pande by his parents. The birth of Swaminarayan coincided with the Hindu festival of Rama Navami, celebrating the birth of Rama. He is said to have mastered Hindu scriptures including the Vedas, the Upanishads, the Puranas, the Ramayana, and the Mahabharata by the age of seven. While on his journey, Nilkanth Varni mastered Astanga yoga (eightfold yoga) in a span of 9 months under the guidance of an aged yogic master named Gopal Yogi. In Nepal, it is said that he met King Rana Bahadur Shah and cured him of a stomach illness. As a result, the king freed all the ascetics he had imprisoned. Nilkanth Varni visited the Jagannath Temple in Puri as well as temples in Badrinath, Rameshwaram, Nashik, Dwarka and Pandharpur. In 1799, after a seven year journey, Nilkanth’s travels as a yogi eventually ended in Loj, a village in the Junagadh district of Gujarat. In Loj, Nilkanth Varni met Muktanand Swami, a senior disciple of Ramanand Swami. Muktanand Swami, who was twenty-two years older than Nilkanth, answered the five questions to Nilkanth’s satisfaction. Nilkanth decided to stay for the opportunity to meet Ramanand Swami, whom he met a few months after his arrival in Gujarat. According to the sect, Nilkanth’s understanding of the concepts of the pancha-tattvas (five eternal elements), together with his mental and physical discipline, inspired senior sadhus (ascetics) of Ramanand Swami. Nilkanth Varni received sannyasa initiation (complete renunciation of the material) from Ramanand Swami on 20 October 1800, and with it was granted the names Sahajanand Swami and Narayan Muni to signify his new status. Sahajanand Swami was later known as Swaminarayan after the mantra he taught at a gathering, in Faneni, a fortnight after the death of Ramanand Swami. He gave his followers a new mantra, known as the Swaminarayan mantra, to repeat in their rituals: the six syllables Swa-mi-na-ra-ya-n. When chanting this mantra, some devotees went into samadhi (a form of trance), also called maha-samadhi (great trance) and claimed that they could see their personal gods. Swaminarayan also became known by the names Ghanshyam Maharaj, Shreeji Maharaj, Hari Krishna Maharaj and Shri Hari. As early as 1804, Swaminarayan, who was reported to have performed miracles, was described as a manifestation of God in the first work (Yama Danda) written by a disciple, Nishkulanand Swami. Swaminarayan encouraged his followers to combine devotion and dharma to lead a pious life. Using Hindu texts and rituals to form the base of his organization, Swaminarayan founded what in later centuries would become a global organization with strong Gujarati roots. He was particularly strict on the separation of sexes in temples. Swaminarayan was against the consumption of meat, alcohol or drugs, adultery, suicide, animal sacrifices, criminal activities, and the appeasement of ghosts and tantric rituals. He forbade alcohol consumption even for medicinal purposes. He proclaimed that four elements needed to be conquered for ultimate salvation: dharma (order), bhakti (devotion), gnana (knowledge) and vairagya (detachment). After assuming the leadership of the Sampraday, Swaminarayan worked to assist the poor by distributing food and drinking water. He undertook several social service projects and opened almshouses for the poor. Swaminarayan organized food and water relief to people during times of drought. Swaminarayan was also an advocate of women’s rights, to some extent. 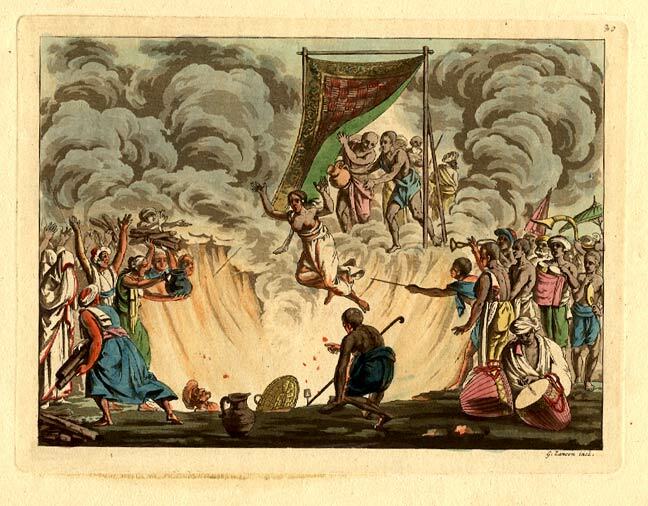 To counter the practice of sati (self-immolation by a widow on her husband’s funeral pyre), Swaminarayan argued that, as human life was given by God it could be taken only by God, and that sati had no Vedic sanction. He went to the extent of calling sati nothing but suicide. Swaminarayan offered parents help with dowry expenses to discourage female infanticide, calling infanticide a sin. In case of widows, Swaminarayan directed those who could not follow the path of chastity to remarry. However he did also lay down strict rules for women which included them being under the control of male members of the family. Swaminarayan restricted widows to live always under the control of male members of their family and prohibited them from receiving any education from any man excepting their nearest relations. The Swaminarayan faith has been linked to patriarchal class structures that subjugate women. Members of the faith are defensive of the fact that some practices seem to restrict women, and make gender equality in leadership impossible. However, while many would assert that Swaminarayan Hinduism serves a patriarchal agenda, which attempts to keep women in certain roles, Swaminarayan himself, despite considerable criticism from those in his own contemporary society, insisted that education was the inherent right of all people. At that time, influential and wealthy individuals educated their girls through private and personal tuition. Hence many male followers of Swaminarayan made arrangements to educate their female family members. The literacy rate among females began to increase, and they were able to give discourses on spiritual subjects. 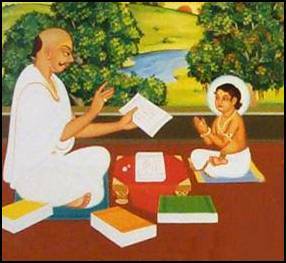 Within the sect, Swaminarayan is considered a pioneer of education of females in India. Swaminarayan was against animal sacrifices as carried out by Brahmin priests during Vedic rituals, such as yajnas (fire sacrifices), influenced by the Kaula and Vama Marg cults. 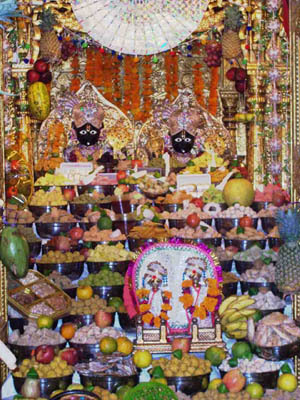 The priests consumed “sanctified” prasad (food offered to deities) in the form of meat of these animals. To solve this problem, Swaminarayan conducted several large scale yajnas involving priests from Varanasi. These did not have animal sacrifices and were conducted in strict accordance with Vedic scriptures. Swaminarayan was successful in reinstating ahimsa (non-violence towards animals) through several such large scale yajnas that did not involve meat. Swaminarayan stressed lacto-vegetarianism among his followers and forbade meat consumption. Some historians believe that Swaminarayan worked towards ending the caste system, allowing everyone into the Swaminarayan Sampraday. However he did not approve of complete social leveling. He instructed his paramhansas (spiritual leaders) to collect alms from all sections of society and appointed people from the lower strata of society as his personal attendants. Members of the lower castes were attracted to the movement as it improved their social status. Swaminarayan would eat along with the lower Rajput and Khati castes but not any lower. He established separate places of worship for the lower caste population where they were in large numbers. However, Dalits, the lowest in the caste system, were always formally excluded from Swaminarayan temples. It is said that Swaminarayan dispelled the notion that moksha (salvation) was not attainable by everyone. He taught that the soul is neither male nor female. Swaminarayan dismissed caste as irrelevant to the soul’s status before God, though in practice caste distinctions remained visible among them though reduced in complexity. Even now, however, for the vast majority of Gujarat’s lower-caste population, the sect is off limits. Swaminarayan ordered the construction of several Hindu temples and installed the images of various deities such as Nara-Narayana, Laxminarayan, Radha Krishna, Radha Ramana and Revati-Baldevji. 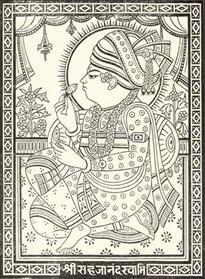 The images in the temples built by Swaminarayan provide evidence of the priority of Krishna. The first temple Swaminarayan constructed was in Ahmedabad in 1822, with the land for construction given by the British Imperial Government. Following a request of devotees from Bhuj, Swaminarayan asked his follower Vaishnavananand Swami to build a temple there. Following planning, construction commenced in 1822, and the temple was built within a year. A temple in Vadtal followed in 1824, a temple in Dholera in 1826, a temple in Junagadh in 1828 and a temple in Gadhada, also in 1828. By the time of his death, Swaminarayan had also ordered construction of temples in Muli, Dholka and Jetalpur. 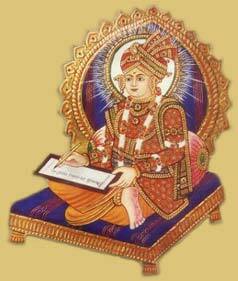 Swaminarayan promulgated general Hindu texts. He held the Bhagavata Purana in high authority. However, there are many texts written by Swaminarayan or his followers that are regarded as shastras or scriptures within the Swaminarayan sect. Notable scriptures throughout the sect include the Shikshapatri and the Vachanamrut. Swaminarayan wrote the Shikshapatri on 11 February 1826. While the original Sanskrit manuscript is not available, it was translated into Gujarati by Nityanand Swami under the direction of Swaminarayan and is revered in the sect as a book of social laws that his followers should follow. A commentary on the practice and understanding of dharma, it is a small booklet containing 212 Sanskrit verses, outlining the basic tenets that Swaminarayan believed his followers should uphold in order to live a well-disciplined and moral life. The oldest copy of this text is preserved at the Bodleian Library of Oxford University and it is one of the very few presented by Sahajanand Swami himself. Acharya Tejendraprasad of Ahmedabad has indicated in a letter that he is not aware of any copy from the hand of Sahajanand older than this text. Swaminarayan’s philosophical, social and practical teachings are contained in the Vachanamrut, a collection of dialogues recorded by five followers from his spoken words. The Vachanamrut is the scripture most commonly used in the Swaminarayan sect. It contains views on dharma (moral order), jnana (understanding of the nature of the self), vairagya (detachment from material pleasure), and bhakti (pure, selfless devotion to God), the four essentials Hindu scriptures describe as necessary for a jiva (soul) to attain moksha (salvation). Swaminarayan strove to maintain good relationships with people of other religions, sometimes meeting prominent leaders. His followers cut across religious boundaries, including people of Muslim and Parsi backgrounds. Swaminarayan’s personal attendants included Khoja Muslims. In Kathiawad, many Muslims wore kanthi necklaces given by Swaminarayan. He also had a meeting with Reginald Heber, Lord Bishop of Calcutta and a leader of Christians in India at the time. Bishop Heber mentions in his account of the meeting that about two hundred disciples of Swaminarayan accompanied him as his bodyguards mounted on horses carrying matchlocks and swords. Bishop Heber himself had about a hundred horse guards accompanying him (fifty horses and fifty muskets) and mentioned that it was humiliating for him to see two religious leaders meeting at the head of two small armies, his being the smaller contingent. As a result of the meeting, both leaders gained mutual respect for one another. Swaminarayan enjoyed a good relationship with the British Imperial Government. 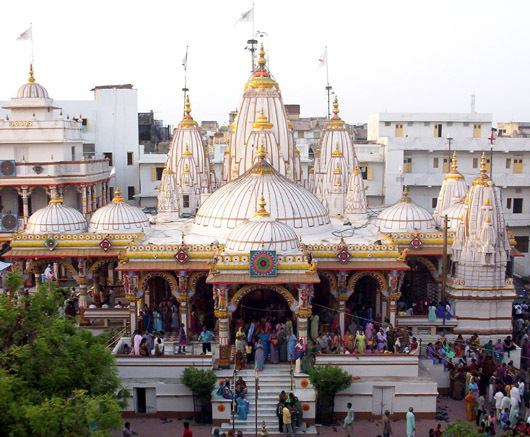 The first temple he built, in Ahmedabad, was built on 5,000 acres (20 km2) of land given by the government. The British officers gave it a 101 gun salute when it was opened. It was in an 1825 meeting with Reginald Heber that Swaminarayan is said to have intimated that he was a manifestation of Krishna. In 1830, Swaminarayan had a meeting with Sir John Malcolm, Governor of Bombay (1827 -1830). According to Malcolm, Swaminarayan had helped bring some stability to a lawless region. It was during this meeting with Malcolm that Swaminarayan gave him the copy of the Shikshapatri currently housed in the Bodleian Library. Swaminarayan also encouraged the British Governor James Walker to implement strong measures to stop the practice of sati. In 1830, Swaminarayan gathered his followers and announced his departure. He later died on 1 June 1830, and it is believed by followers that, at the time of his death, Swaminarayan left Earth for Akshardham, his abode. He was cremated according to Hindu rites at Lakshmi Wadi in Gadhada. Chutneys are a very important component of meals throughout India. Westerners usually know only of chutneys that are cooked and bottled, but there are dozens of common chutneys that are made fresh daily and which act as dipping sauces or condiments. 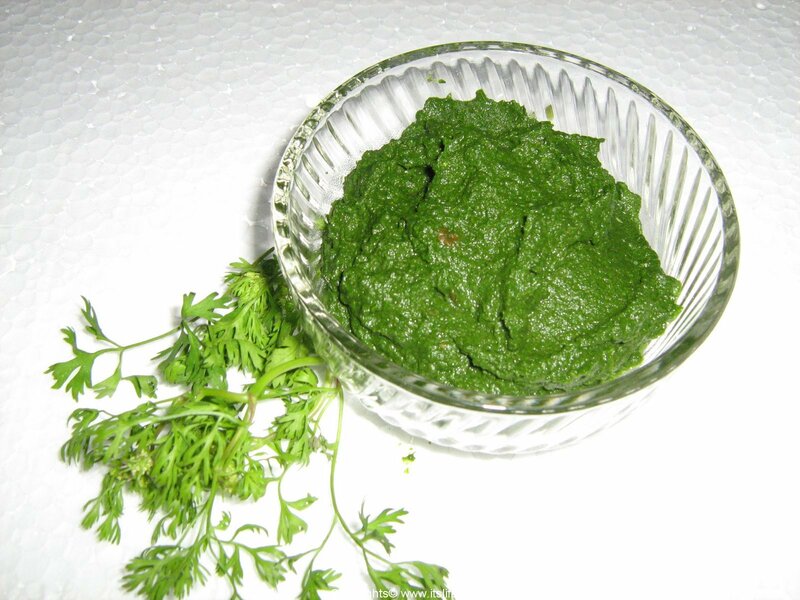 Probably the best known is coriander chutney, made by blending coriander leaves with herbs and spices. You can also make this chutney using half and half coriander and mint leaves. Another favorite of mine is mint leaves blended with plain yoghurt. 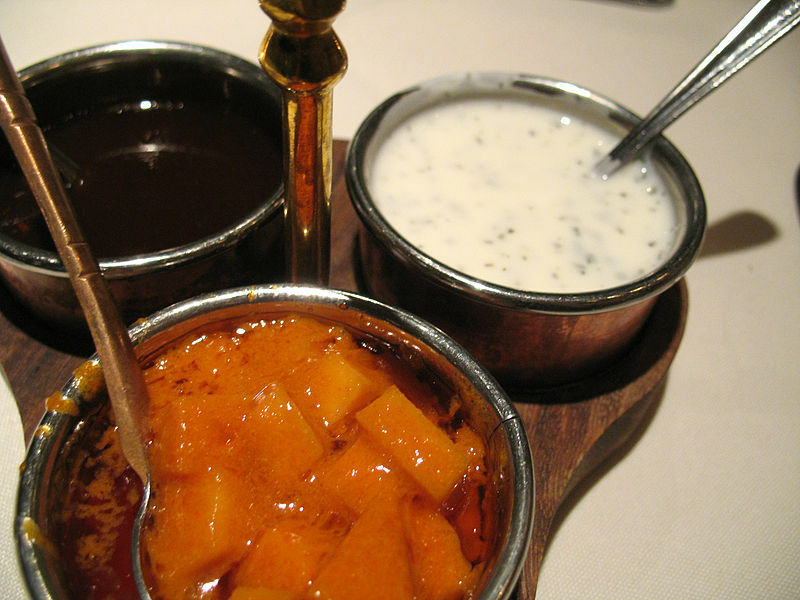 It is customary to serve 3 or 4 chutneys with a meal, some sweet, some fiery hot. Grind the ingredients in a blender. Add a little water and grind again.